The Peoples Democratic Party (PDP) has described the list of alleged “looters” published by the Federal Government as “hollow and laughable”. The party dismissed the list in a statement issued by its National Publicity Secretary, Mr Kola Ologbondiyan on Friday in Abuja. 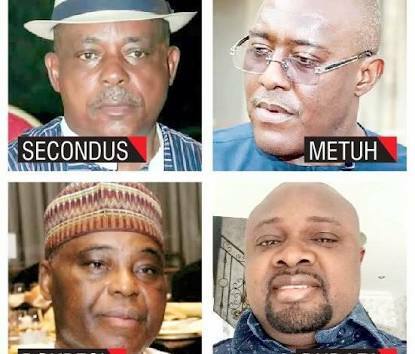 PDP described the list as an extension of Federal Government’s media trial and challenged it to come up with names of its members against whom the government had secured convictions. Ologbondiyan stated that the list put forward by the Federal Government as purported looters amounts to a cheap blackmail, saying that none of those listed have been indicted or convicted by any court of competent jurisdiction or any panel of enquiry in the country. PDP said the list made available by the Minister of Information, Alhaji Lai Mohammed, only revealed that the All Progressives Congress (APC) and the Presidency have no prove of corruption against the PDP. The party added that in its “frenzy and desperation”, the Federal Government even included names of individuals who were not standing trial or under investigation for any act of corruption, as well as people not even PDP members. The party said that the APC thus betraying its desperation to mislead the public, the court and divert attention from the heavy looting involving its members. Ologbondiyan added that it was unfortunate that the APC and its government under whose watch horrendous sleazes were happening on daily basis. He noted that the APC led government which had failed to fulfill the littlest of its campaign promises, could spend a wholesome three years searching for flimsy allegations to discredit PDP and its members. “This is a government that is yet to account for $26 billion (N9 trillion) stolen through corrupt oil contracts in the NNPC, N1.1 trillion worth of crude diverted to service APC interests, N18 billion Internally Displaced Persons (IDP) intervention fund stolen by APC officials. “This include the former Secretary to the Government of the Federation (SGF), Babachir Lawal, the N10 billion National Health Insurance Scheme (NHIS) for which members of the Buhari cabal were indicted. “This includes the Mainagate, where the APC government recalled and reinstated an individual indicted for scam running into billions of naira. He emphasised that the PDP was on a rebound, saying that such flimsy allegations by the APC and its horde of looters, could not stop it from challenging the Federal Government to fulfill its campaign promises. “Since, the APC has decided to draw this attack, we will no longer hold back but appropriately commence a serialization of all looters hiding in APC and the Presidency,” he said. Meanwhile, the Federal Government through, Lai Mohammed, had released a list of persons who allegedly looted dry Nigeria’s economy under PDP watch, describing the list as just a tip of the iceberg. “Then PDP Financial Secretary on the 24th of Oct. 2014, he took N600 million only from the office of then NSA. “Then National Publicity Secretary Olisah Metuh, who is on trial for collecting N1.4billion from the office of then NSA. “Former President Jonathan’s Cousin Robert Azibaol – on Thursday, a Federal High Court ruled that he has a case to answer for collecting $40 million from the office of then NSA,” Mohammed listed.